On May 19, the Hip Hop Chess Federation hosted the second edition of "Hip Hop Chess and Life Strategies" at the Omega Boys Club, a community center in inner-city San Francisco. Besides, IM Josh Waitzkin, the recent author of "The Art of Learning", the headliners of the event were RZA from the Wu-Tang Clan and Qbert , a famous DJ ("revolutionary scratcher" in Waitzkin's words) who plays to sold out crowds all over the world. The day included casual chess, freestyle rapping and a panel discussion about the relationship between hip-hop, chess and martial arts. Adisa Banjoko, the co-founder of the Hip Hop Chess Federation, moderated the panel, and was particularly excited by: "the synergy between RZA and Josh....it was like an unstoppable object meeting an immovable force." Video edited by Michael Perry. Song "The Formula" by DOC. Adisa Banjoko aka "The Bishop" made the many connections between hip hop and chess official in February 2007, the birthmonth of the HHCF, which he founded with Leo Libiran. Adisa is frustrated with depictions of Blacks and Latinos in American media, and notes a lack of variety in the hip hop music and imagery from mainstream outlets. "When you think of the imagery of the Black or Latino male, a whole lot of things come to mind but the first words are probably not 'contemplative', 'introspective' or 'strategic'. I wanted the hip hop chess federation to show a truth that's out there but not being spread." Adisa is also seeking out more females interested in both chess and hip-hop for future events. "It can be a very cruel and difficult world for a young woman of color without a strategy." Chess also has an image problem, although it's opposite to the problems with hip hop that Adisa describes. Rarely do the adjectives, "party", "freestyle" and "hip-hop" come up when thinking about our rich game. Through his events, Adisa hopes to emphasize the festive and social aspects of the game: "I'd rather call the events exhibitions than tournaments, cause I don't want people to be freaked out about winning or losing. I want it to be fun." Josh certainly had a blast at the event: "It was an amazing, soulful event." he told CLO. Adisa was impressed and amused by how well Josh got along with the hip-hop players when he realized: "Dudes like rugged Monk from the Wu -Tang are the kind of people who taught chess to Josh when he was a kid in Washington Square Park. Then I realized why Josh was so comfortable with these street cats." The Wu-Tang Clan, arguably the most influential rap group of the 90s, has been vocal about their passion for chess for a while. In 1993, on the Wu-Tang Clan's debut album Enter the 36 chambers, a lyric from "Da Mystery of ChessBoxin" goes : "The game of chess is like a swordfight. You must think first before you move." Musicians and movies "use" chess frequently to show they're smart or make metaphors. But for the Wu-Tang Clan, and especially for two of nine core members, RZA and GZA, the passion for chess is deep and serious. In 2005, GZA released an album called Muggs vs.GZA: Grandmasters. RZA and Qbert are serious chessplayers, and you can certainly see by the positions on the boards that they know something about pawn structure. Josh Waitzkin estimated the strongest of the hip hop chess players to be high class level but was uncomfortable pinpointing a likely USCF rating range: "I have this feeling that it kills the vibe to slap a number on them. They're not tournament players...but they're plunging deeply into the game." We will definitely get a chance to check out their play in more depth. Adisa is planning more HHCF events including a third edition of Hip Hop and Life Strategies in the Bay Area, tentatively set for August 18. When 64 squares line up in eight columns/ continued meditation calculate life's problems/ I strolled the globe with a bag of gold shingles/ crafted individually wrapped up platinum singles/ diamond links sit on my collarbone/ a fistful of dollars/ my spacecraft is blown by the hurricane holla/ a peter potomus/ I flow over the metropolis/ in a hot-air balloon/ I got spotted by binoculars/ of ivan kolov/ but the vibes I throw off/ that blew the rash of the head of Mikhail Gorbachev/ Try to compare my signal / but my source is too digi/ my team is connected to a seam vibrate in MIDI/ hit this pace/ I become one with space/ while you was dipped in the pool of Allah's grace/ when I get a bright idea/ the lightbulb is bright as Times Square/ these n**** s can't rhyme here/ keep my foresight pouring/ I smash on the teacher who miseducated Lauren/ Hill, this aint no fire drill/ this shadow of steel walk forth from the place Park Hill/ my mic will transform into a double-barrelled shotty/ hollow-tipped lyrics will drill holes in four bodies/ I put the sword on your flat upper part/ the wrath will slay judas before the last supper start/ I been tried like gold in a furnace, you can't burn us/ I roll with a thousand and one Nat Turners/ maybe it's for your pops I cop/ 45,000 miles I conquest, surrounded by the sky/ even with a sword above your head, you still try/ to come amongst us righteous men and spread lies/ we the hard rock set hood cat no gat/ Wu-Tang will conquer the whole planet with bats/ you can't understand my impact in fact/ not too long ago you thought this planet was flat. I was profoundly impressed with RZA--the man has a deep wisdom. He showed up with two friends--Monk and Reverend--who were his two ringers to team up against the SF crowd. Right off the bat RZA went to war with Kevvy Kev, Shepherd squared off with Kevin Epps (film maker, made "Straight Outta Hunters Point"), and Casual (from Hieroglyphics) went after Monk (part of the Wu Tang crowd). Meanwhile Qbert was ripping up a pretender who claimed to be a chess teaching guru. I was giving a simul against some kids when Monk and Casual got into it...hilarious, but a little edgy. Monk made a touch move claim which would hang Casual's king. Things got heated, but the beautiful thing is that it was all settled over the board. It was some high level street chess--some of these guys can REALLY play. And they were all introspective, passionate chess players, wide open to learning. I played a few games with Monk and then showed him some things, psychologically and over the board--I suggested he drop the opening books and pick up Shereshevsky's Endgame Strategy and he was thrilled. The whole event came to a climax with a panel discussion, standing room only, people spilling out of the Omega Boys Club, between RZA, me, Adisa, Kevvy Kev and Qbert. Adisa was moderating, and we were exploring the connections between hip hop, chess, martial arts, Taoism and Buddhism (which RZA actually brought up), the learning process. 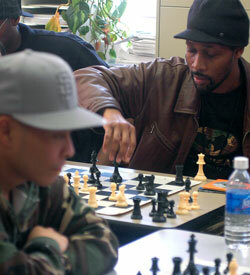 A soulful man, D"Lamont, who teaches chess and life to urban youth and does everything, says everything, in a rhythmic, pulsing manner-- told me that he is always telling his students that they should do what they should, not what they want. I suggested that in the next step, with good, organic, introspective practice they will want to do what they should.